One of our most popular layouts. 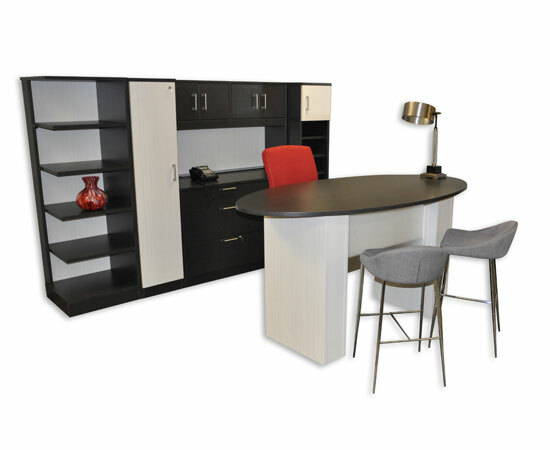 The peninsula U-shaped desk with mixed pedestal storage is a very functional way to maintain storage while providing a large meeting area for 4 or more people. 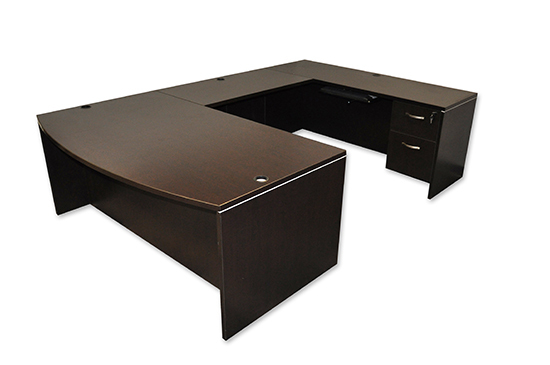 Customize your sit stand desk with a cover up desk shell. 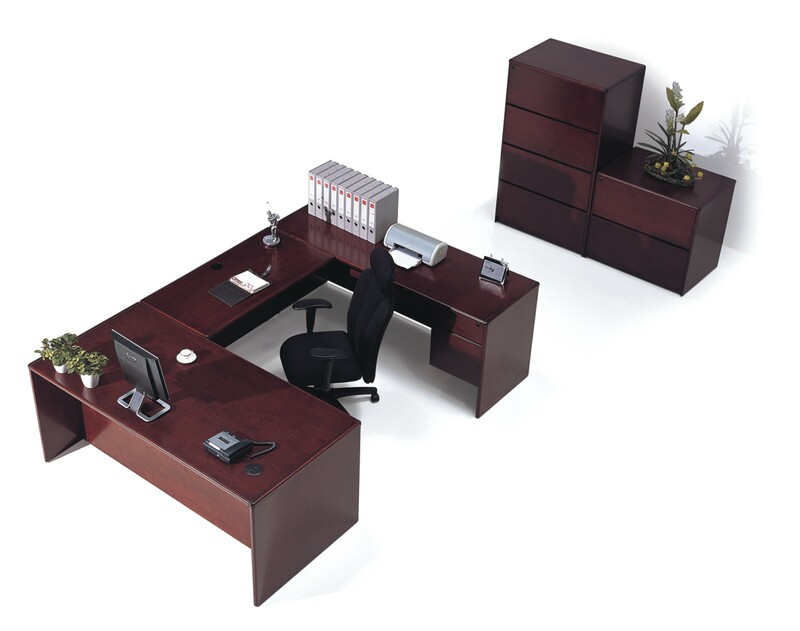 Available in many styles such as standard desk, l-shape, u-shape and many more. 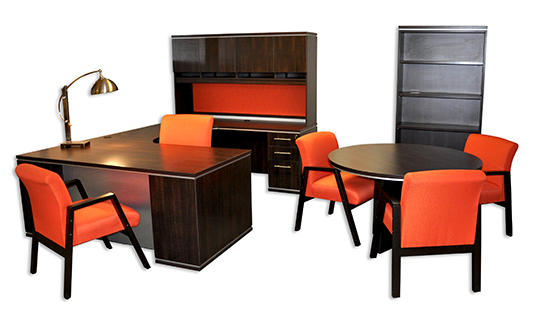 Many sit stand desks on display in our showrooms. Our most popular system now comes in Espresso. Because it is modular, Podany’s stocks it in hundreds of configurations. Each piece has the 1 1/4″ Dura top, unheard of at this price point. 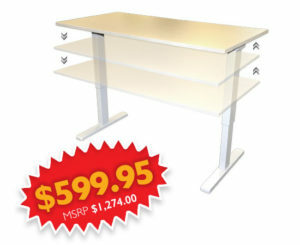 Whether you need 1 desk or 200 desks, Podany’s has this in stock for immediate delivery. 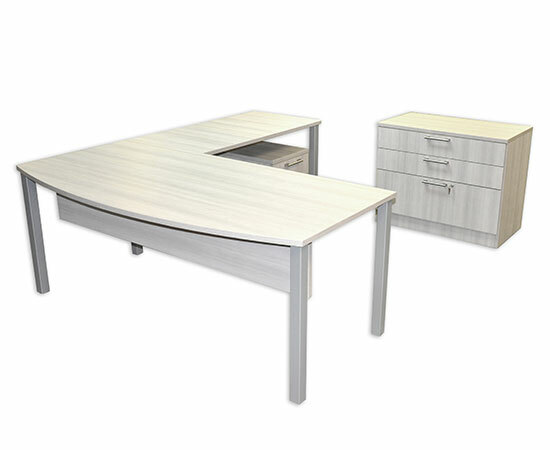 Contemporary desk series in the latest beach and white or all pear finishes. Made from durable laminate for high durability and low maintenance. 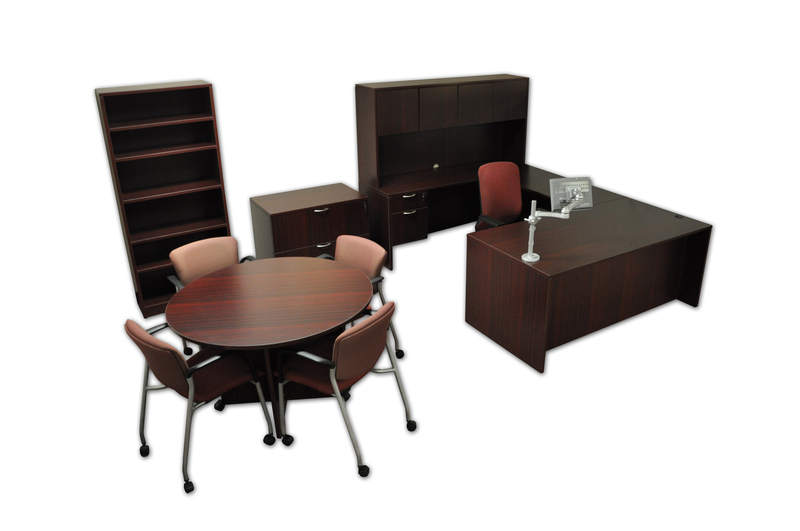 This series includes executive L-desks, standard double pedestal desks, unique bin style bookcases, conference tables, mobile pedestals, and lateral files. All in stock in both finishes. 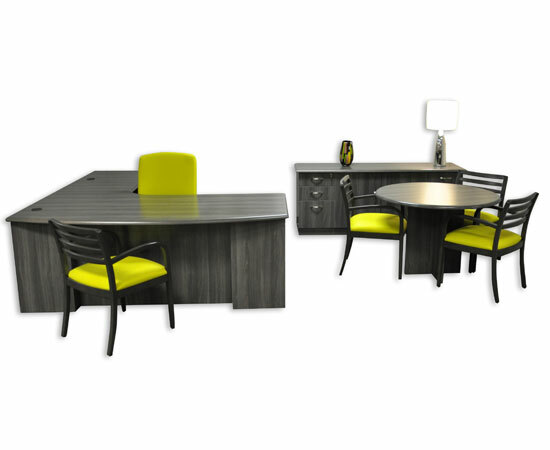 Is your family’s office desk or workstation often shared? 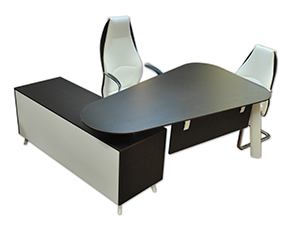 There are many ways to create a partner desk. 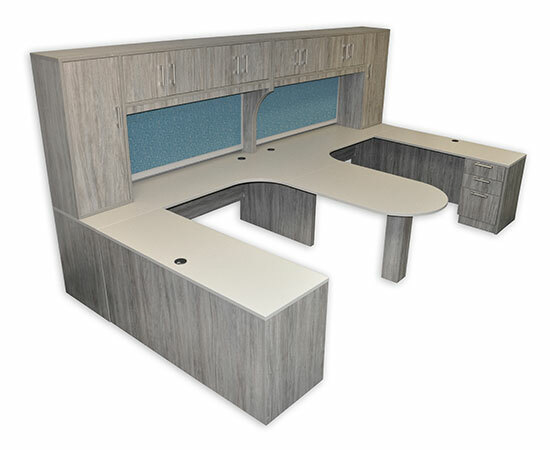 This custom desk utilizes an angled corner with an open table desk to create a shared workspace. Milano Grey combines the durability of laminate surface and the beauty of a solid wood edge deatail. Complete line that hundreds of matching pieces. If standard sizes don’t work, we can customize. Can’t find your laptop under those huge piles of paper on your desk? 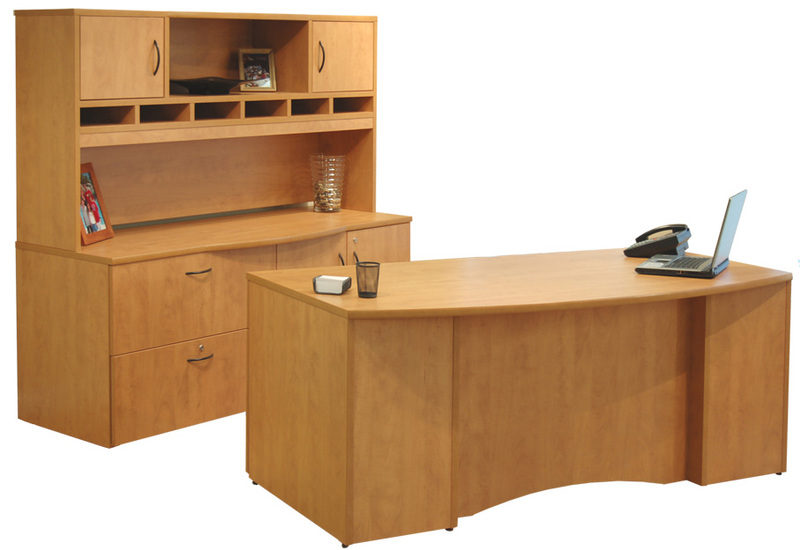 This desk with a storage credenza is just what you need. It provides ample storage with plenty of room for your laptop. Custom stand up desk series. The latest trend in office furniture. 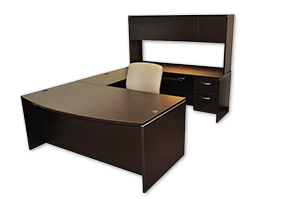 Stand up desk comes in many finishes, shapes and sizes. Add a matching storage wall unit to fit your needs. Come and see it on our showroom. 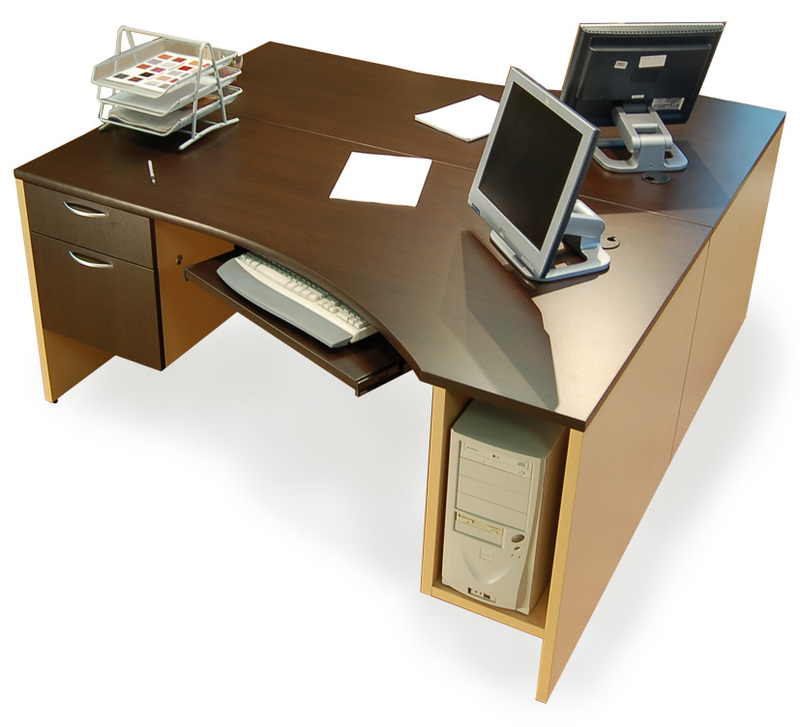 Angle corner desks are perfect for small areas where standard L-shape just won’t work. If you can’t go longer then 4′ on either side, but you want to take advantage of a corner space, they’re sure to be the perfect fit. 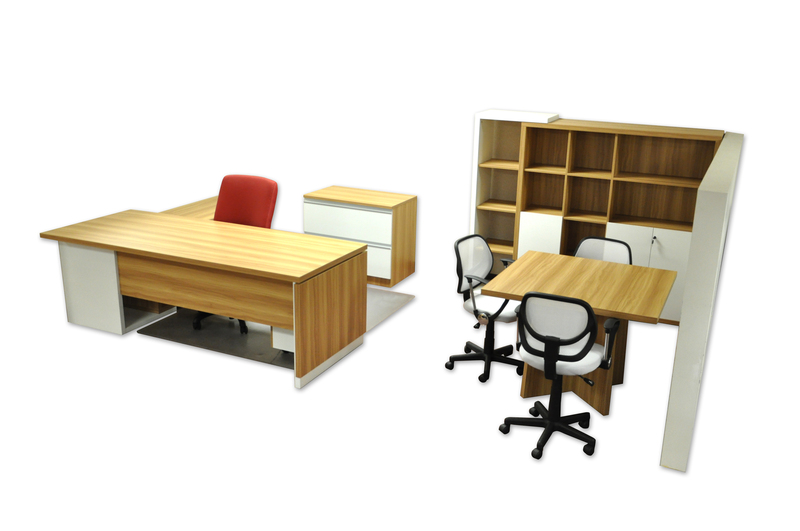 They also work back to back to create a great shared work space. Do you want a wood desk but you’re afraid that it will be too hard to maintain? 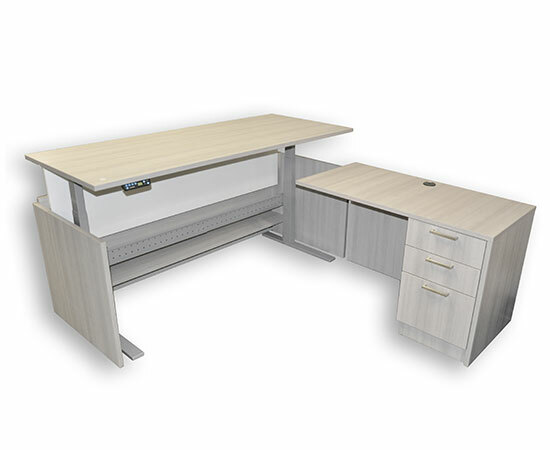 Our executive wood line with granite lacquer clear coat is a great way to ensure that your desk will continue to look great through years of service. Available in 18 different configurations! In Stock. Pick your color: 20 colors available (white shown here). Pick your handle: silver and black available (silver shown here). 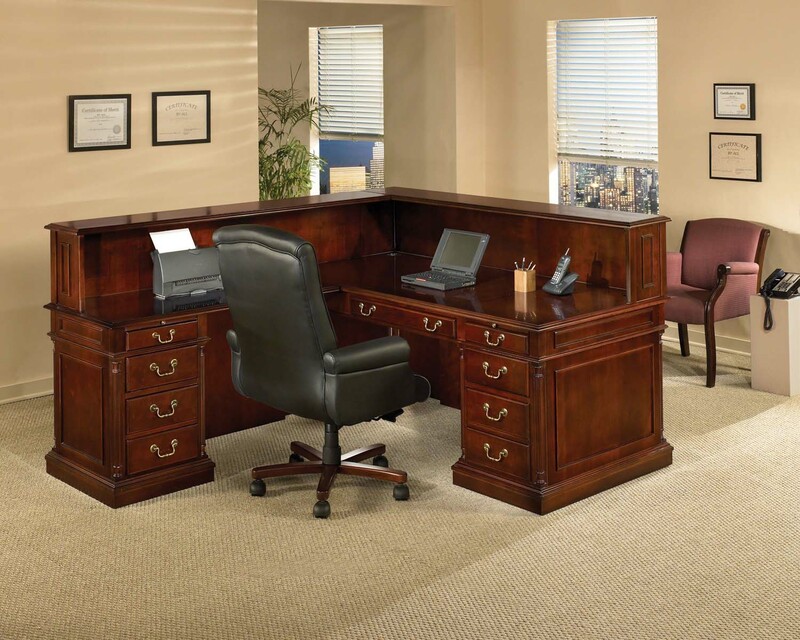 Pick your size: corner desk with storage (6′ x 9′ shown here) and 6′ book case with 3′ x 6′ table with casters. Custom office suites are available. 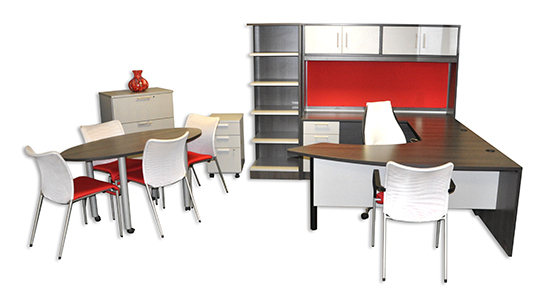 Choose size configuration, storage needs, and color. 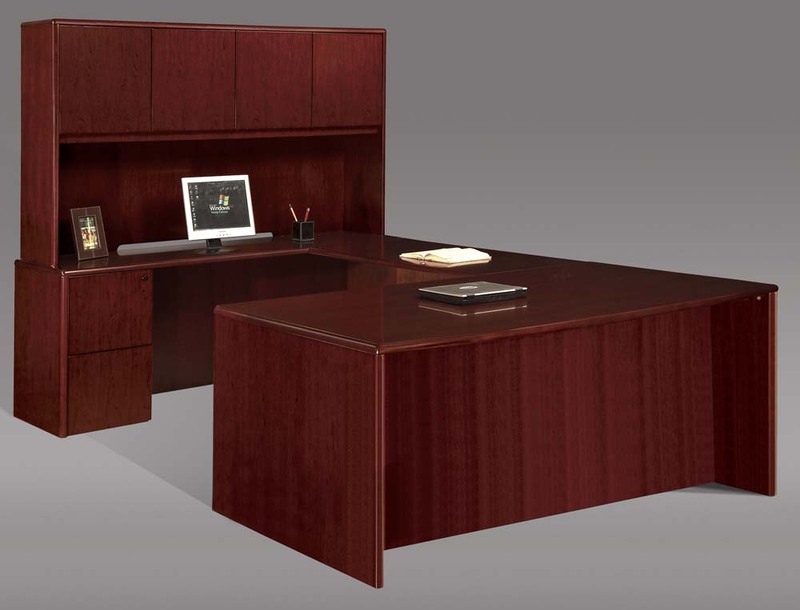 Shown is a 6′ executive desk, 6′ storage credenza, hutch with sorter, and bookcases. Maple with pewter accents complete the custom look. This 6′ x 6′ metal leg series offers clean, simple lines. 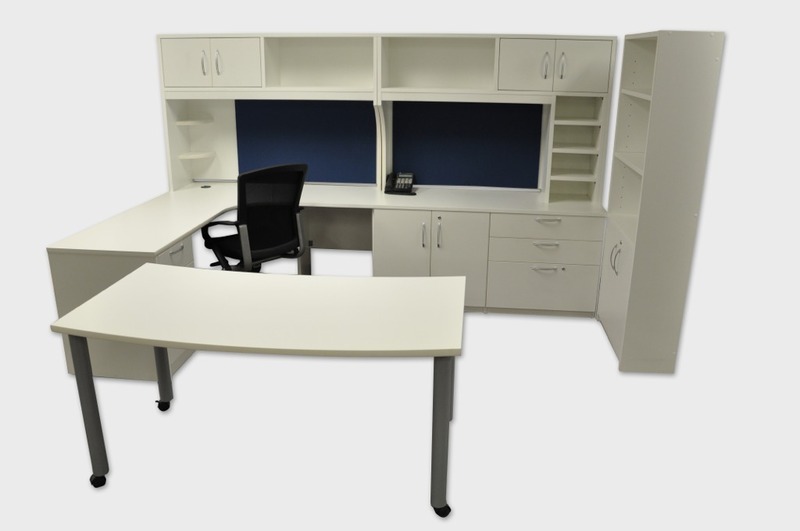 By adding cabinets and files, work-space and storage needs are fulfilled. Pick your size, color, and handle design to complete the look. 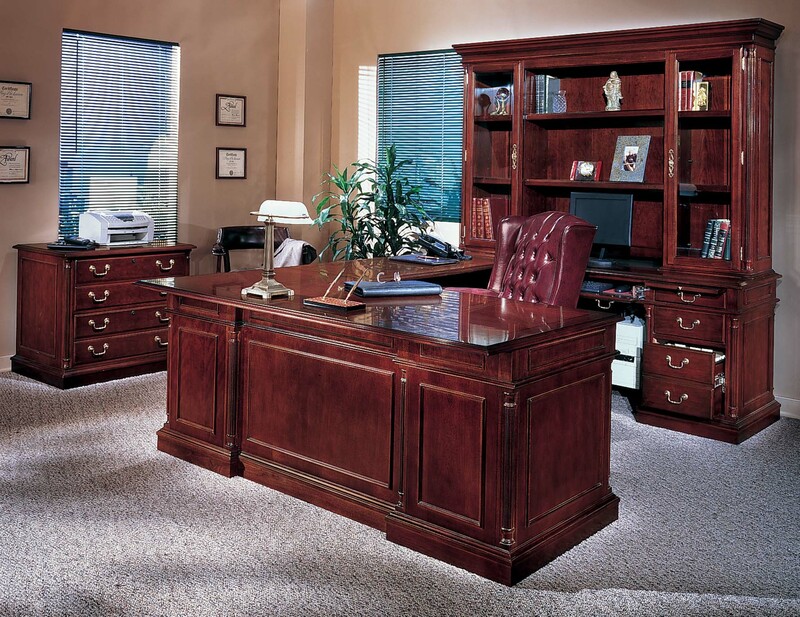 Our custom laminate series offers the ability to design your office. 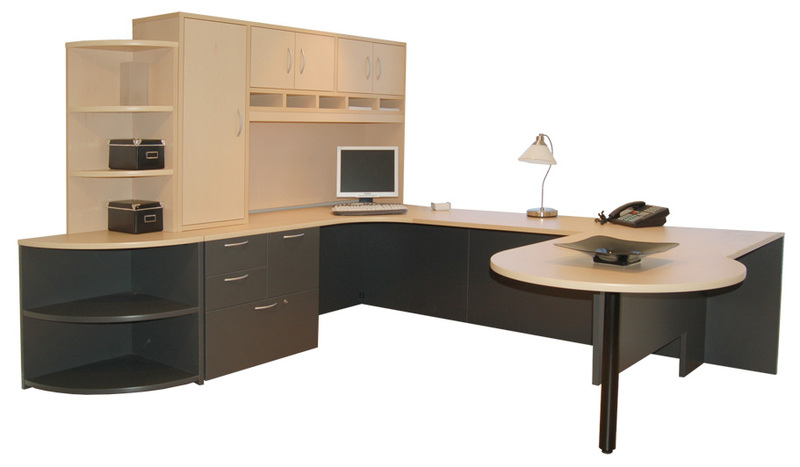 Shown: three 6′ x 6′ angled corner desks with hutches. 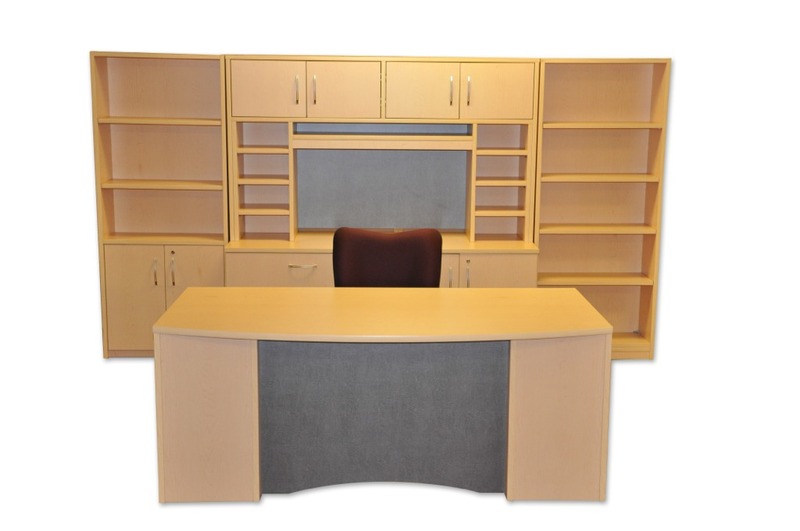 Complete your office space with this 6′ x 7′ reception desk. 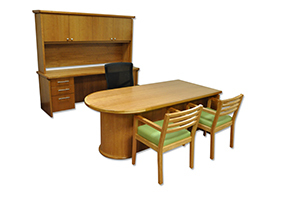 Shown in an English cherry finish featuring locking pedestals, pull-out writing boards and two transaction counters. 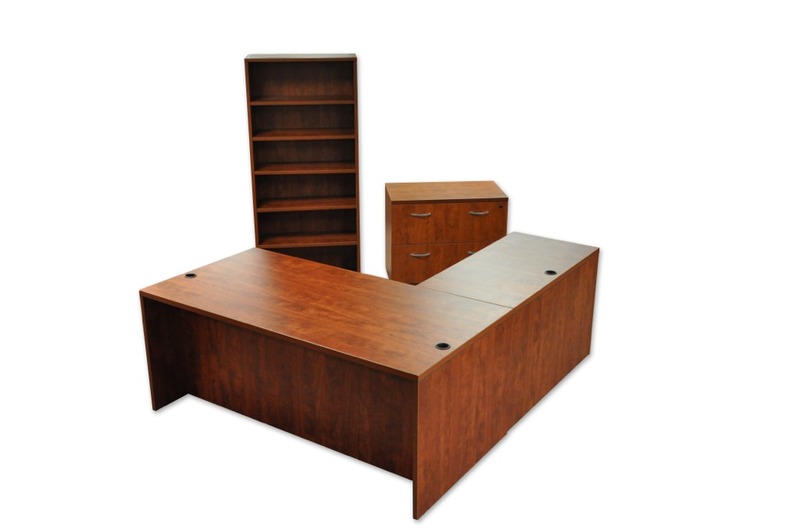 This 6′ x 9′ U-shape Contempo desk in mocha finish offers built-in storage. 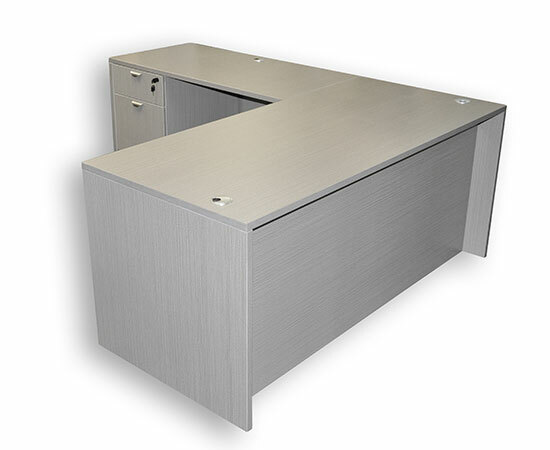 Satin aluminum accents and nickel pulls add to its sleek design. Choose from bookcases, storage cabinets, and files to complete your storage needs.